Jazzy Jonez: Staycation or Stayhome? TravelZoo hit me up with this breaking news via Twitter about a local resort that is having a great Labor Day sale. I should preface this by saying is just not any resort. This is the same resort President Obama stayed at during his 1st visit to the Valley since his oath. 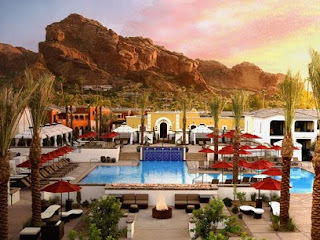 The InterContinental Montelucia Resort and Spa is offering rooms until September 7th for a starting daily rate of $95 per night. This deal also includes a free room upgrade and $25 resort credit. I’m not mad at that at all. I went over to the website to see if this was for real. I can totally see me having a staycation here since all my friends are going to be in DC labor day weekend and didn’t invite me to join. *pout* Staying here will probably make them green with envy. Yea. Story long short, the rate did work. Now I just have to consult with my other half and see if he’s down to do this for one day during Labor Day weekend. Our first staycation together we stayed at this beautiful B&B. We were having a great time until he had the nerve to invite his boy to come over and join us. I was livid. I grabbed my bag and left. I turned off my phone and we didn’t talk for three days. Now that I think about it, I probably should not suggest this idea to him. He just may be bound to repeat history.